Invited by Professor LIANG Changhao of Solid State Physics (ISSP), Professor Anton Fojtik from Czech Technical University visited ISSP on 25th September. 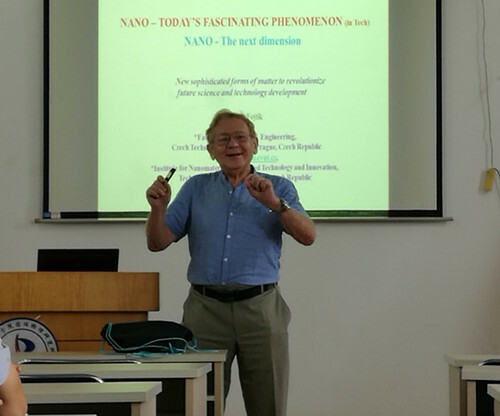 He gave the lecture named with “Nano-Today’s Fascinating Phenomenon” in the morning and discussed the topic of “NANO IN MEDICINE AND BIOLOGY” with employees and students in the afternoon. Professor Changhao Liang presided the presentation and the debate for the whole day. In the morning, as the pioneer of nanotechnology, he simply introduced the developing process of nanotechnology based on his own initial research work. Then, He depicted many kinds of semiconductor materials (e.g. CdS, Cd3As2, Si, Ge and so on) generated by nanotechnology and how they applied in various fields, and analyzed the mechanism based on energy level theory. In the afternoon, he introduced his own research work about how to prepare magnetic nanoparticles and tune the basic properties and test in clinical applications. Meanwhile, more than 6 hours, he discussed with employees and student of ISSP about some special problems in experiments and then guided the students to conduct experiments in our laboratories. He gave us a profusion of suggestions about experiments and novel ideas and excited us to do more and better scientific researches in the future.